Pakems were inspired on a ski trip when the creator took off her ski-boots and wished she had a packable alternative for her tired feet with her. 5 Days of Last Minute Gift Ideas: Day 5 is for Good Cheer! It is no accident that this gift suggestion was saved till Friday. In celebration of the end of the week, and as we head full steam towards Christmas, we have the perfect gift for your friends that like to imbibe. Look no further than Vargo's NEW Titanium Funnel Flask released in October 2014. 5 Days of Last Minute Gift Ideas: Day 4 is about the gift of learning and memories! Instead of trying to find the perfect thing to give, try something different and give the gift of an experience. Encourage someone to head outdoors and try something new or learn a new skill by signing them up for a class. Before purchasing a GPS device and/or a locator beacon, consider the new inReach Explorer from Delorme. 5 Days of Last Minute Gift Ideas: Day 2 is for anyone looking to lose weight! Don't worry I am not going to recommend some low-fat, health conscious, trail snack or the latest exercise gadget. I am the one who loves backpacking so I can eat my forbidden guilty pleasures of Snickers and Top Ramen. I am however going to recommend an awesome sleeping bag for anyone who wants to shed some serious size and weight, but isn't quite ready to head toward the ultralight quilt option. Any of the Spark Sp sleeping bag series by Sea to Summit will score you major gift giver points! I tested the Spark Sp II and loved it... the official review is in the works, but know it gets 2 thumbs up. TheSpark Sp II regular length bag weighs in at 16.4 oz and compresses down to the size of a large grapefruit. This simple, but effective, bag features a 1/3 length zipper, 10D Nylon shell for minimal weight, and is filled with ULTRA-DRYDown™. *Long also available. Specs on website. Gift Wrapping Tip: Compress it down and put it in a small box or gift bag. No one will ever suspect it is a sleeping bag. 5 Days of Last Minute Gift Ideas: Day 1 is for Fido! Looking for a gift or stocking stuffer for your four-legged outdoor companion? Look no further head here to buy some TurboPUP bars! Looking to support some of the smaller guys this holiday season? Here are 3 companies that we love. We know and have met the owners of each, who all rock, and they make great products. Personally I can't live without their lip balms and Goop! They have an amazing line of all natural sunscreens, lotions and skin care products that are worth checking out. I have been wearing their sunglasses for years after switching from one of the big industry giants. Their motto is "Nobody Owns Us" and they make top quality sunglasses and ski goggles at totally affordable prices! They make sunglasses meant for all athletic pursuits and fashion forward styles for around town. If Betty and Norman could talk they would tell you to stuff Fido's stocking with TurboPUP bars this year. They make the perfect meal replacement bar for long days out with your 4-legged partner or work as a savory snack. Feel great about supporting this veteran-woman-owned business and know your dogs will LOVE you! What better way to celebrate Veterans Day than heading into the wilderness for a hike with friends and Betty the TurboPUP. Driving up a very dreary and moody Hwy 2, we cleared the cloud cover at around 6000' to a perfect Fall day in the Angeles National Forest. With cool temps, blue skies and not another person in site we headed out on the Mt Waterman trail. Over the next 8.5 miles there was lots of friendly conversation, but also quiet as we soaked in the beauty around us. I enjoyed the time to reflect and started thinking about it being Veterans Day. Almost exactly a month ago on October 10, 2014 this area became part of the new San Gabriel Mountains National Monument. We are lucky to live in country where preserving and protecting wilderness areas like these is a priority. Lucky to live in a country not in war, where we can wake up and feel safe to go about our daily lives. We have this this security due to the men and women who serve in the armed forces risking their lives to afford us this luxury. In honor of Veterans Day I would like to give a special thank you to 3 special veterans. The first is Stacy Bare. I have never met someone more committed to getting people outdoors. As Director of Sierra Club Outdoors this is his job, but he goes above and beyond inspiring others and taking a first-hand role in making sure that fellow veterans are getting to experience the magic of the country they fought to protect. As a 2014 National Geographic Adventurer, The North Face Ambassador and a regular blogger on the Huffington Post he tirelessly works to share with others the importance of getting outdoors. I am honored to call him a friend and mentor. Here is his story. Next up... Kristina Guerrero, Founder and CEO of TurboPUP. Aside from having an infectious smile, great laugh, and an obvious passion for our 4-legged friends, Kristina is a decorated US Air Force Veteran. 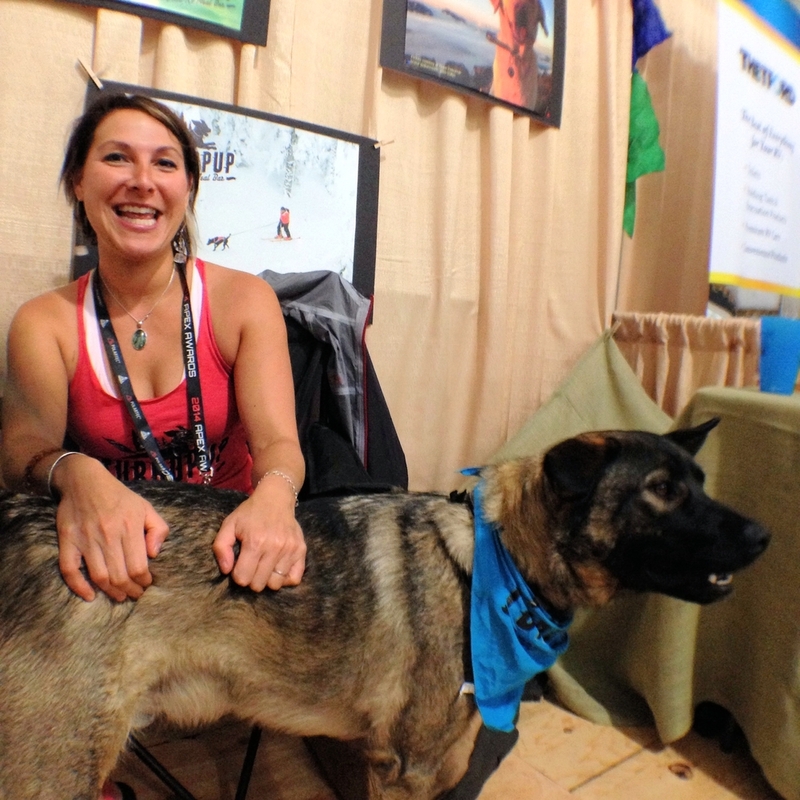 She currently is the mastermind behind Betty's favorite trail snack and backpacking food, the TurboPUP bar! These bars are a complete meal replacement bar for dogs using premium, human-grade ingredients in a convenient waterproof package perfect for hitting the trail. Leave the kibble at home and bring TurboPUP bars. We are thrilled to be a part of the TurboPUP Team supporting this Veteran Owned Business! The final thank you goes to my brother-in-law Lt Commander James Tilden who is spending his Veterans Day serving his country overseas. We are so proud of him and lucky to have him in our lives. A special shout out to his wife, Nicole, and the families of all who serve and have served. Happy Veterans Day to all of our servicemen and servicewomen... thank you.